Angela practices as a genetics counselor at the Oncology Genetics Clinic at the UW Carbone Cancer Center. 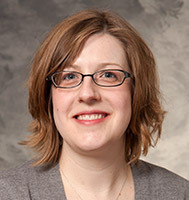 She specializes in hereditary cancer syndromes, including Hereditary Breast/Ovarian Cancer Syndrome and Lynch Syndrome. Angela sees patients upon referral from a physician, and directly for cancer genetics risk assessment and counseling. She is a certified genetic counselor through the American Board of Genetic Counselors.